Its Morris dancing, How hard can it be? Dartmoor Border Morris are a family based, mixed Morris side who like to have fun whilst Morris dancing. We like to encourage anyone of any age or social background to have a go, & no one will get turned away! The only limitation is you need to be reasonably physically able, but age should not be a factor! Our youngest is early 20`s, our oldest dancer is 80! We perform our dances with sticks made of ash wood ( supplied), & our dance style can be quite vigorous , brash & loud! So after a 2 hour practice on a Wednesday night you will not be needing the gym! In all our practices & “out`s”, we suggest good stout foot wear like boots or flat shoes need to be worn to protect your ankles & feet. Most of our dances can be found on our website by clicking on MEDIA, then YOUTUBE. Most of our dances have been filmed so you can study a dance in finer detail at home. The dance practice is lead by the nominated dance Foreman & their deputy, who will talk you through each move, before walking you through each dance, then on to dancing it with the music. If dancing is not your calling, how about joining the band? Again anyone with a sense of rhythm can join , & any instrument will be welcome! If you can carry it & play it, your in. Sorry, no Grand Pianos! All our tunes can be found on this website under MEDIA, then MUSIC. There you will find all the tunes labelled in dance order, but click on one to open as a PDF file showing the dots for that tune for you to print off & learn at home. We have a nominated Lead musician, who decides at the beginning of the practice season, which tunes we shall play & the style. 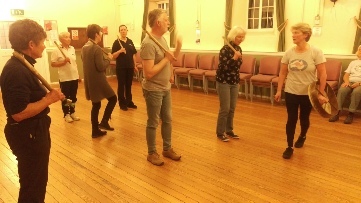 We practice in Meavy Parish Hall every Wednesday from 8 PM till 10 PM, from the middle of September until the end of April. Check the main diary page for around Christmas time, we might miss a practice & party instead! Come 10 PM, we all head over the village Green to the Royal Oak Inn for a drink & a bit of a social catch up. Musicians are allowed to let rip with their latest musical find, & we stay until the landlord kicks us out. From May 1st until the end of August, we perform at pubs across Dartmoor, usually with another Morris side. However, we also do a lot of other events all through the year, ranging from Summer fairs, Wassails & Mummers Plays. 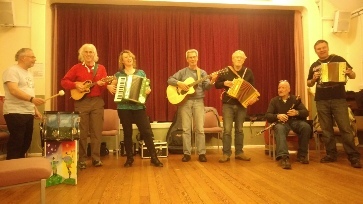 If you would like to join our happy little band, just turn up on a Wednesday evening in Meavy Parish hall & say “ It`s Morris! How much fun can I have?” Or come and see us perform & ask about joining!